Experience world-class comfort and luxury in every Leisure Bay Hot Tub and pamper yourself with warm baths and massages any time, any day. For over thirty years, Leisure Bay Spas has been the trusted name in hot tub innovation and designs. Its unique and advanced features have not only made spas popular to many but their decades of contribution to elevating product standards and setting the benchmark have made many hot tube users happy. The best hot tubs at reasonable prices – this is what Leisure Bay Hot Tubs are all about. Each spa can last for many years because they are made from materials and components that go through a series of testing and quality checks. Whatever the model, users are guaranteed with safe hot tubs that meet high CE standards. Newly developed spas and parts must also comply with strict measures before they can be released to the public and approved for production. When it comes to being stylish, Leisure Bay hot tubs are also one to beat. With its versatile line of spas, customers can choose from a variety of colors, sizes, waters jets and massage features and then own one that ultimately meets one’s hot tub requirements. Customization is also possible and users can request to have the color of the lighting system to be modified. To add it to its relaxing vibe, most Leisure Bay hot tub models also come with waterfall effects with a stream of water cascading on the sides which also complements the tub’s under water LED lighting. Within arm’s reach is a ‘touch control display’ – a device containing easy-to-use commands used for controlling and changing settings. A quick and brilliant way to know temperature reading and play with controls even while you are slumped in your tub. Any Leisure Bay tub is also fortified with a thick layer of insulation called ‘Tri-Matrix Insulation” which functions as a protective surface and one that also maintains water temperature. The tub itself regardless of model is built from strong hot tub parts such as acrylic, a material that should be strong enough to hold out weight and withstand impact. When you have four to six people sitting and playing in the tub, the toughest of components are imperative. Cabinets or the spas’ outer casings are made from heavy-duty structure and are especially constructed to hold out against unwanted blows and the worst weather conditions. Sturdy and well-made cabinets are essential in outdoor hot tubs while filters are necessary to keep water in any type of spa safe and clean. Leisure Bay hot tubs prevent water contamination by using high grade filters that trap dirt and preserve water quality for a long time. Filter cartridges can be easily purchased and are easy to replace when the need arises. 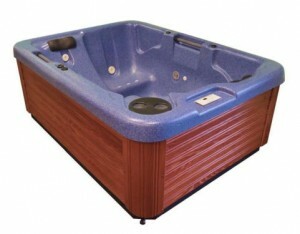 Another vital Leisure bay hot tub parts would be its 24 hour circulation pump with an adjustable filter cycle. This part helps clean the water by letting it pass through fifteen to twenty cycles i n a day. And with a device called, ‘Balboa Ozonator’, water and air pressure are regulated so that one can be sure that water coming in through the tub is always fresh and clear. Balboa Ozonator not only helps you save up on chemicals but it is also plays a crucial part in maintaining temperature and in promoting energy efficiency. A spa cover serves as an effective shield for hot tubs when it is placed on top to protect its vital parts. And when you have Leisure bay hot tub covers, one does not have to worry about finding one that fits. One may choose from the following designs: midnight opal, pearl white, carribean blue, redwood duralife brown, oyster opal, sahara, blue grass, and redwood duralife grey. Customer satisfaction does not end in the factory nor does it only happen at the hot tub dealers when you buy a brand new unit, and you can count on Leisure Bay Spa to know what excellent customer service is. Customers can always depend on Leisure Bay to provide assistance and to respond to inquiries when it comes to warranty, parts and service. 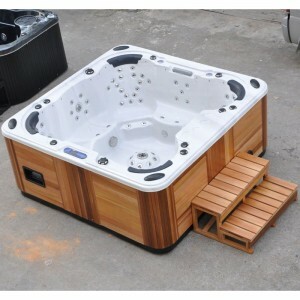 Leisure Bay hot tub models are classified into five different categories with each series possessing a unique set of features. They are called the Easy Series, the Fourwinds Spa Series, Polysteel Series, Celebrity Series and Elite Series. Whether you are looking for a 2 person hot tub or something big enough to accommodate your family, Leisure Bay hot tub series has the right tub for you. The Easy Series has two models, the Galaxy and the Easy Spa. Both types are UL and CE listed making them safe for you and your family. They are also fitted with isolation covers and equipped with digital control panels. Six models comprise the Four Winds Series: the Utopia, the Caribbean, the Maui, the Jamaica, the Cabo, and the Barbados. Treat yourself to a quiet time of relaxation coupled with a full shoulder and neck therapy when you buy a hot tub from these series, complete with Balboa Ozonator and digital controls. For a spa built with a maintenance-free cabinet, go with the Utopia. The Polysteel Series are composed of the Adirondack, the Gibraltar, and the Summit. What makes this Leisure Bay Hot tub category stand out is its exchangeable colored lenses found in the LED lights. All three models are also equipped with a polytuff cabinets, digital temperature controls as well as self-diagnostics. The Hilo, the Tonga, and the Santo are the three types that make up the Celebrity Series. If you seek programmable lighting systems to help change the ambience and easy-to-use digital controls, this is the series for you. The last, but certainly not the least of the five classes is the Elite Series which has a total of seven models. All of which have what is called a “chemical free heater”, a backlit-Casede Waterfall, self-diagnostics, manifold planning, and a floor drain. Be it classic or the modern style, each Leisure Bay Hot tub holds great qualities that one look for in a hot tub. Check out their website to learn more about these amazing designs and visit hot tub reviews to learn what others have to say about these five series. Come visit your favorite stores and retailers for the updated hot tub prices. This entry was posted in hot tub reviews, hot tubs for sale, leisure bay spas, luxury, Portable hot tub, spa, ways to relax and tagged best hot tubs, hot tub price, hot tub reviews, leisure bay spas, luxury spas, Portable hot tub, relax, spa, spa for sale. Bookmark the permalink.